In April, the Department of Justice sued Apple and five major publishers, alleging they colluded to raise the price of e-books. Three of the publishers agreed to a settlement earlier this year, which would provide credits to customers. Amazon and Apple have informed some e-book buyers that they'll receive credits for future book purchases, as part of a recent settlement three major publishers signed to settle a price-fixing lawsuit. Eligible Kindle e-book customers will receive credits ranging from 30 cents to $1.32 per book, Amazon estimated. Apple did not specify a range. Customers who bought qualifying e-books between April 1, 2010 and May 21, 2012 are eligible for a refund, and won't need to do anything in order to receive their credits. If approved by the court, the credits can be used for future e-book purchases. Amazon customers may also use the credit for print books. Any customer affected by the price-fixing scheme may also receive a check instead of a credit by visiting www.EBookAGSettlements.com. Amazon crowed in its email that the "settlements are a big win for customers and [we] look forward to lowering prices on more Kindle books in the future." The settlement is also a big win for Amazon. In April, the Department of Justice sued Apple (AAPL) and five major publishers, alleging they colluded to raise the price of e-books. Three of the publishers -- Hachette Book Group, CBS's (CBS) Simon & Schuster and News Corp.'s (NWSA) HarperCollins -- agreed to a settlement earlier this year. As part of the proposed settlement, the three publishers agreed to provide money for a $69 million fund that would pay out credits to affected consumers. Amazon (AMZN) and Apple sent emails to their customers over the weekend to explain the credit and settlement, which is pending court approval at a hearing in February. Both emails explained that the settlement is between the government and the publishers. Amazon was not named in the lawsuit, while Apple said last month it will likely appeal the approval of the settlement. Apple, as well as publishers Macmillan and Pearson's (PSO) Penguin, opted not to settle and their case is set to head to trial next June. 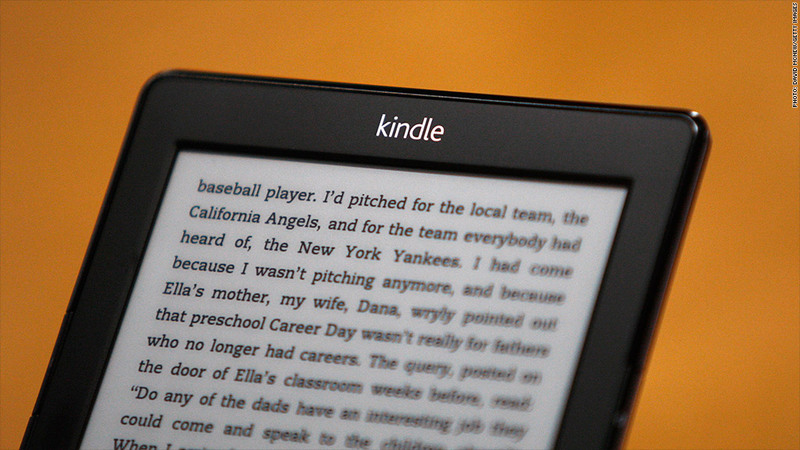 Before the release of the iPad in 2010, Amazon's Kindle was the preeminent e-book reader on the market. Amazon forced publishers to sell most books at $9.99. According to the DOJ's lawsuit, booksellers were unnerved by the discounted e-book price structure Amazon launched in 2007. The publishers went to Apple in late 2009 to find a way to force Amazon to raise its prices, and the debut of the iPad a few months later proved to be the perfect tool. The alleged conspiracy placed many books at so-called "agency pricing," putting them on the market at about $12.99 and giving Apple a 30% cut. About three days later, Amazon allowed publishers to set their own prices, resulting in higher prices for Kindle e-books as well. The DOJ alleged that as a result of the arrangement, e-book customers paid between $2 and $3 more for each book, amounting to upwards of $100 million more than they otherwise would have spent. As part of the settlement that the three publishers agreed to, they'll be required to grant retailers like Amazon and Barnes & Noble (BKS) the freedom to reduce prices -- and for the next two years, they won't be able to sign contracts with retailers that restrict such pricing decisions. For five years, the publishers will also be blocked from entering contracts with retailers that contain so-called "most favored nation" clauses that prevent the publishers from selling to other retailers at lower prices. Finally, publishers will also be forced to tear up their current agency pricing agreements with Apple, as well as any other deals with retailers that contain pricing restrictions.